Happy Cinco de Mayo! I have no idea why we celebrate this in the U.S. - I guess we Americans are happy to find any reason to party and have a potluck at work. This recipe is sorta kinda Mexican...and definitely yummy. Rinse chicken breasts with water and pat dry. Rub with olive oil. 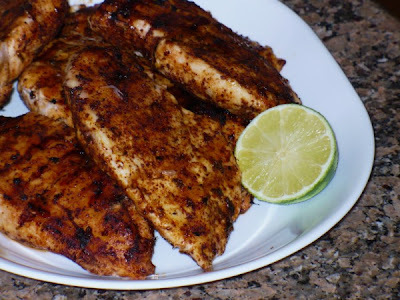 In a small bowl, combine chili powder, brown sugar, lime zest, garlic powder, salt and cayenne; rub all over chicken. Preheat grill to medium heat. Grill chicken for 10-12 minutes turning once halfway through cooking time, or until juices run clear. Squeeze fresh lime juice over breasts before serving.